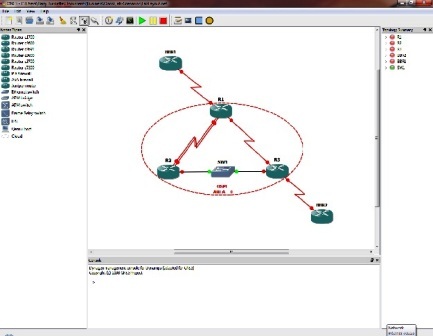 In this exercise we will remove the IGRP configured in our previous exercise Basic Router Setup then configure OSPF in area 0 and verify its connectivity. You can configure this lab using the Dynamips or GNS3 lab described in the article Basic Practice Labs Introduction , or actual hardware you have access to. Subscribe to this site and send me an email atsupport@freeciscolab.com requesting access, and I will send youeverything you will need to complete this lab as well as all the up and cominglabs at no cost that’s right FREE. But you must register and send me a requestin order to be eligible for this offer. You will also receive a completesolution to the previous weeks exercise including configuration file each weekby email. Shutdown the S3 interface on R1. Remove the IGRP routing protocol from all routers. Enable OSPF with process ID 200 on R1, R2 and R3 routers. Enable all interfaces on R1, R2 and R3 routers to run OSPF in area 0. Display the routing table on R1, R2, and R3; verify that you have full connectivity to all other routers. Insure that you can ping R1, R2 and R3 from other routers. What is the OSPF router ID of R2 and R3? Show the OSPF neighbor state on R3. Which router is the DR on the Ethernet connection between R2 and R3 and why. Shutdown the E0 interface on R2 and R3. Change the priority to 2 on E0 of the router that was the BDR and enable the Ethernet interfaces of R2 and R3. Which router is the DR now? Enter the debug ip ospf adj on R2. Disable and enable the E0 interface on R2 and note the OSPF adjacency debug messags. Disable the debugging on R2. Display the OSPF database on R1. What type of link state advertisements do you see in the database? Display the OSPF interface information on R2 and R3. What is the OSPF network type of Ethernet and serial interfaces of R2 and R3. What is the OSPF hello interval on the Ethernet and serial interfaces? Enable serial interface S3 on R1. Do you see the loopback interfaces subnet address on BBR1? Save the running configuration of all routers. This is such a fantastic useful resource that you’re offering and also you give it away free of charge. I adore seeing web sites that understand the value of providing a quality resource for free. It?s the old what goes about comes around program.